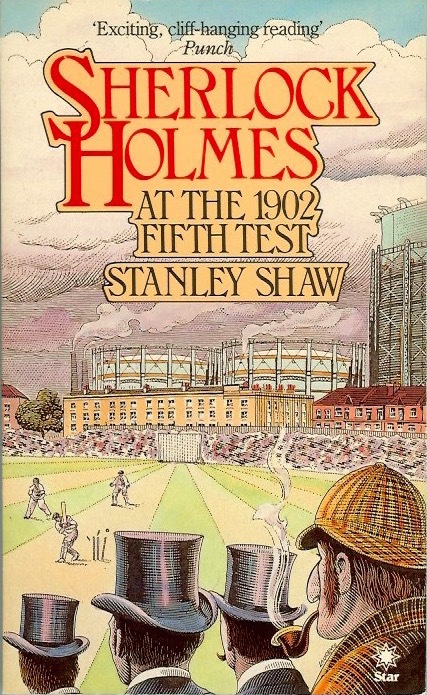 Sherlock Holmes at the 1902 Fifth Test by Stanley Shaw was first published in hardcover by W.H. Allen in 1985. This is the 1986 paperback will illustrations by John Lawrence. I don't believe the book was ever published in America. It was Wednesday, 13 August 1902 and one of English cricket's most glorious days when the Oval Test Match was snatched from the jaws of defeat against the Australians. But what role does the greta Detective Sherlock Holmes have to play in the sporting triumph? And to add further intrigue, how did an unknown young Australian render a service to English cricket that has remained an international secret to this day?